The University of Mississippi Carriage House and an (assumed) domestic servant, collodion glass plate negative by Edward C. Boynton, a professor of chemistry, minerology, and geology from 1856–1861. Courtesy of the University of Mississippi Department of Archives and Special Collections. 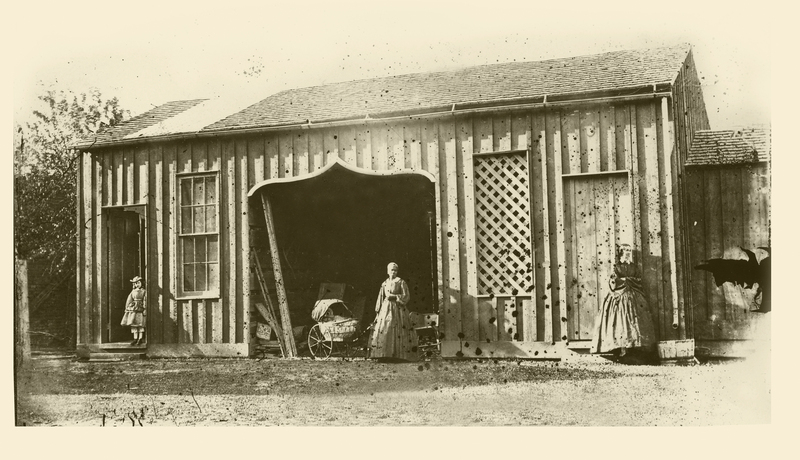 One day in what was probably the year 1860, Edward C. Boynton, the new Professor of Chemistry, Minerology, and Geology at the University of Mississippi, took a picture of the carriage house behind his faculty residence. Boynton was practicing using his new photography equipment by taking shots of campus buildings as well as his own family members. The new photographic technology he was testing, known as “the wet-collodion process,” had just been invented. The technique utilized individual glass plate negatives which were fragile and “somewhat cumbersome and tedious,” but were superior to “earlier daguerreotype and calcotype processes… and produced images of remarkable sharpness and fine grain.”1 All of the antebellum photographs of the UM campus were a result of Boynton’s new hobby and the fortunate coincidences that resulted in the survival of his box of high-quality fragile glass negatives. In the photo he took of the carriage house, we can clearly see three figures. On the far right stands Boynton’s wife, Mary Hubbard Boynton, in a long dress. On the far left, we see his 6 year-old daughter, Lizza, dressed in petticoats and a sporty brimmed hat. And in the middle, framed by the opening of the carriage house, stands an African American woman. Wearing a long cotton dress with a white collar and a scarf covering her head, she rests her right hand on the handle of a wheeled bassinet, likely holding Boynton’s 4 month-old baby, Florence. What was her name and who was she? What was her relationship to her owners and masters, the Boyntons? What did her work entail? Where exactly on campus did she live? What was her relationship to the University? And, most importantly, what was her relationship to the other dozens, perhaps hundreds, of African American slaves who worked on the University of Mississippi campus, and in the surrounding town of Oxford, during those antebellum years? Was her experience similar to those who worked the campus fields and gardens that provided for the student meals in the Steward’s Hall or the cooks and waiters who served these meals? Was it different from those who labored to fire the hand-made bricks and construct the earliest campus buildings, such as the Lyceum and the Observatory? Did she interact with the other slaves who undertook the domestic chores of caring for the students and faculty: building their fires in the morning, making their beds, laundering their clothes, making their meals, emptying their chamber pots? 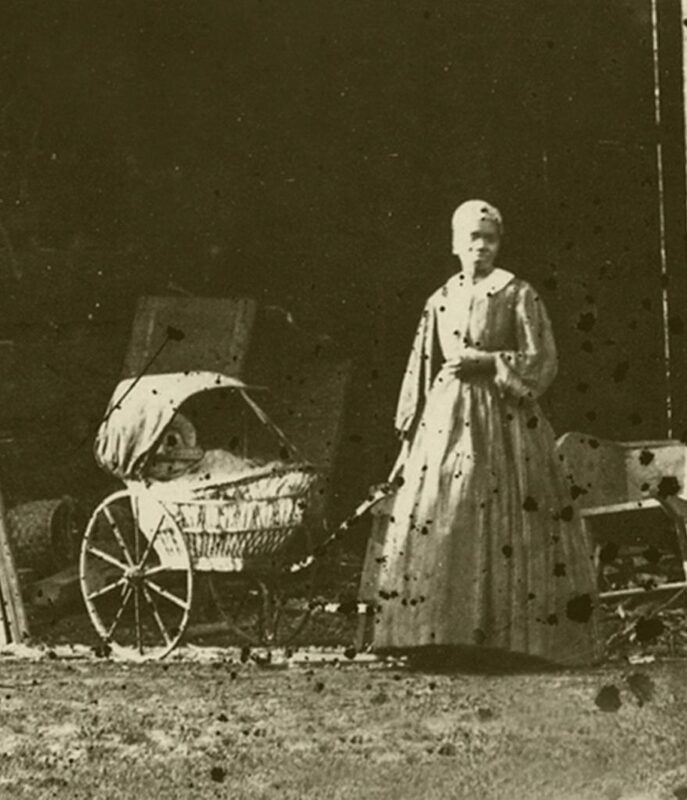 Detail of an (assumed) domestic servant from The University of Mississippi Carriage House collodion glass plate negative by Edward C. Boynton, a professor of chemistry, minerology, and geology from 1856–1861. Courtesy of the University of Mississippi Department of Archives and Special Collections. And what happened to her after the war, after her owner and master, Edward Boynton had been dismissed for harboring Northern sympathies and left the University? Did she leave Oxford along with other free people of color to build a new life elsewhere, or did she remain, perhaps even returning to work on the very campus on which she was standing when this photo was taken? As yet, we know none of the answers to these questions because Boynton’s slave, so far as we know, left no letters or documents of her own. It is unlikely that she could even read or write, though she may have been able to do so. Like most of her enslaved contemporaries, her life is shrouded in obscurity; almost completely absent from the material traces typically left by society’s more privileged citizens. Not even the Federal Government, required by law to enumerate every individual in the nation every ten years, asked for her name. What hope does the historian or archaeologist have to ever recover these traces never recorded? Especially when even the faintest signals have been lost, denied, hidden, and even intentionally repressed for over 150 years? But the stories of slavery and the University of Mississippi are not completely lost. Many fragile traces of antebellum slave life on this campus are actually “hidden in plain sight.”2 We know, for instance, the names of the enslavers and the extent of their slave ownership. 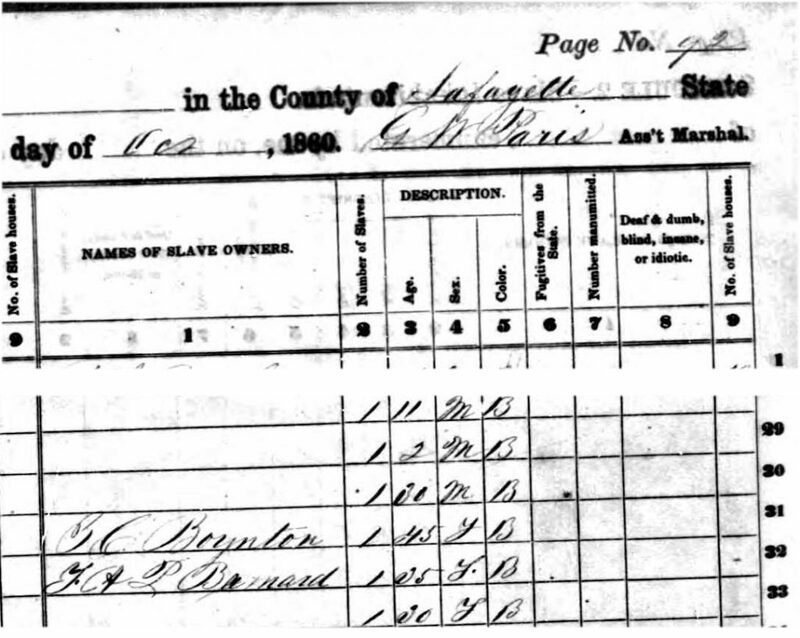 We also know that slavery was a fact of life in North Mississippi prior to the Civil War. Nevertheless, even these facts and details are often obscured by lenses of misperception and misunderstanding. They are minimized, even, by the dynamics of national shame and denial associated with our collective memories of American slavery and the racial biases of the scholars who have spent decades constructing them. The enslavers are often called “wealthy planters” in our institution’s official history, the slave labor camps that enriched them and created the economic wherewithal for the founding of the University itself: “plantations.”3 The details of the founders’ slaveholdings, perhaps casting too dark and painful a shadow for us to fully contemplate, are conveniently omitted or carelessly neglected. Nevertheless, the fragile traces are there, waiting to be fully recovered, explored, and understood. On this webpage, the University of Mississippi Research Group, which was formed in 2014 out of an interest to explore new scholarship on slavery and the legacies of slavery, seeks to address these historical omissions and social neglect. Here we present the findings from our research and our attempts to more carefully understand the relationship between our own institution—The University of Mississippi—and the “peculiar institution.” We also plan to lay out our next steps for creating an ongoing campus-wide interdisciplinary research, teaching, and community outreach effort aimed at recovering, preserving, exploring, and understanding slavery and its legacies here in our own locale. 1 James B. Lloyd, The University of Mississippi: The Formative Years, 1848-1906 (Oxford, Miss. : John Davis Williams Library, Department of Archives and Special Collections, 1979), 19. 2 UMSRG member Jodi Skipper, as quoted in “UM Students Dig for Clues about Slaves’ Daily Lives,” UM Press Release, April 24, 2015. 3 David G. Sansing, The University of Mississippi: A Sesquicentennial History (Jackson: University of Mississippi Press, 1999), 36, 32.